Our individual garment size guides enable you to match your chosen knitwear with the best-fitting items from you current wardrobe. To help you choose the correct size, we recommend viewing the individual size guides on each product page. 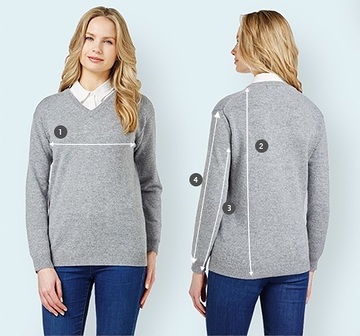 Simply click on the sizing tab on the style page when you've found a garment you like. To Fit Chest (in) 33" - 35" 36" - 38" 39" - 41" 42" - 44" 45" - 47" 48" - 50"
Measure across the chest two centimetres below the underarm seam. The sleeve length, from shoulder point to cuff. If you have any questions about the sizes of our clothing, please feel free to call our friendly Customer Service Department on 61 2 8607 8687 - they know all of our garments inside out - literally!